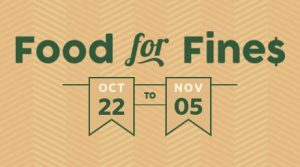 Reduce your UBC Library fines by donating non-perishable food items until November 5th. 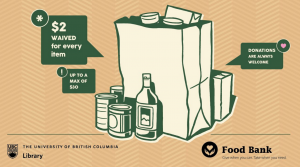 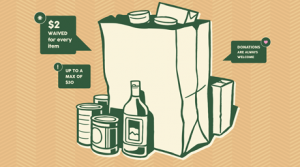 Reduce your UBC Library fines by donating non-perishable food items. This year’s UBC Library and Alma Mater Student Society Food for Fines Campaign raised a total of $3,600.00. 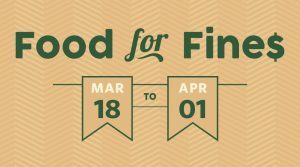 Reduce your UBC Library fines by donating non-perishable food items – $2 in fines paid for each food item donated (up to a maximum of $30). 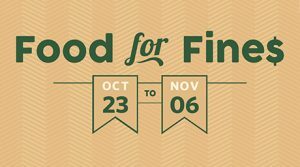 Donated cans are accepted at branch circulation desks from October 24th to November 7th, 2016.